The PReSBOX® provides the latest in asphalt speciment preparation and mix evaluation technology. PReSBOX® produces high quality asphalt prisms from which beams and cylinders with excellent air voids distribution, homogeneity and particle orientation can be cut. The unique shearing action of the PReSBOX® closely replicates the conditions under which asphalt is placed in the field and produces specimens with excellent homogeneity and volumetic properties, giving an exceptional measure of workability. The PReSBOX® also provides an accurate measure of the workability (relative effort required for compaction) of Hot Mix Asphalt (HMA) needed in the field to achieve a target void content. The PReSBOX® Shearbox Compactor features a PC interface for user entry of compaction parameters, and provides a real-time graphic display of data, e.g. specimen height, vertical stress and air voids per cycle. Controlling PReSBOX® is IPC Global's Multi Axis Controls System (IMACS). IMACS delivers leading edge performance, unparalleled control and the ultimate in flexible data acquisition. 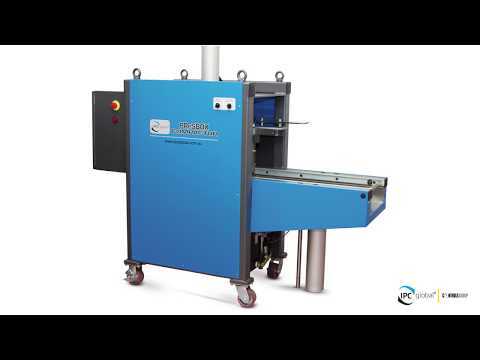 PReSBOX, Asphalt Prism Shearbox Compactor. 220-240 V, 50-60 Hz, 1ph. Pneumatic filtration kit - wall mount, 12 bar. PReSBOX has been designed to replicate the field properties of asphalt, in a simple and efficient manner.